Does Paladin have the ‘shine gene’? The book sounded like ‘another one of those’ horse tip books: “Horse Owners’ Essential Tips: Grooming, Care, Tack, Facilities, Riding, Pasture ”. There must be hundreds of those books on the market, I thought, and did not have great expectations. 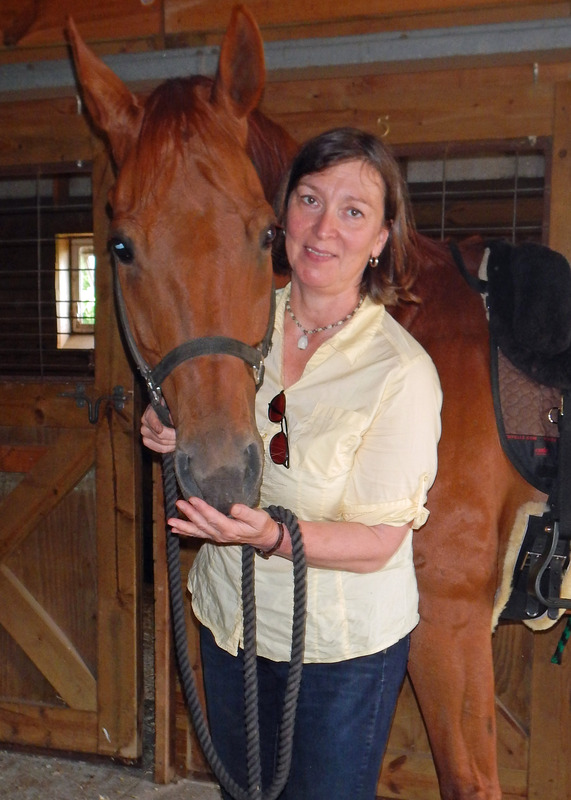 (A horse owner’s) Life, however, can be full of surprises and this was a positive one! 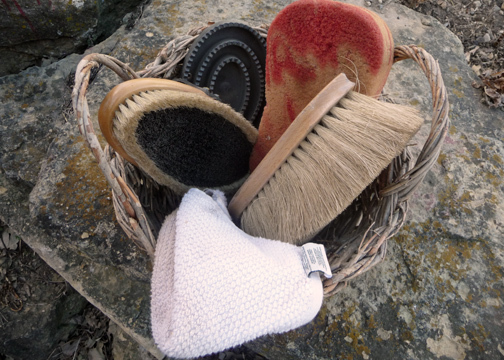 So, if your are so inclined, I recommend you put Horse Owners’ Essential Tips: Grooming, Care, Tack, Facilities, Riding, Pasture in your shelf or on your Christmas list. It’s a keeper! In a nut shell: ‘Cinchy’ describes a horse that shows an adverse reaction to the saddle cinch or saddle girth, either during the saddling process or well before – for example when approaching the horse with the saddle. These adverse reactions can range from subtle (tense facial expression) to aggressive (kicking or biting). Any response apart from a relaxed acceptance must be viewed as a defensive response on part of the horse. 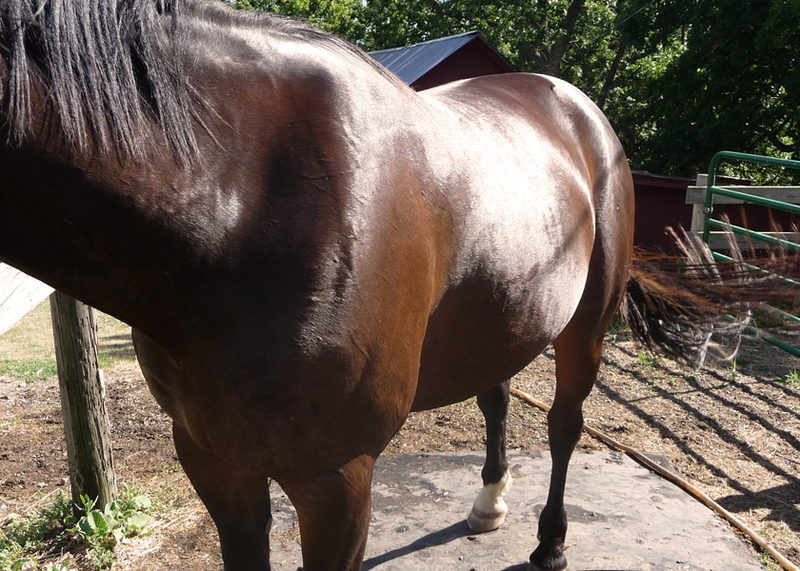 Why is my horse ‘cinchy’ or ‘girthy’? A google search shows: Most trainers address a negative reaction to the girth or cinch as a behavior issue. This is an unfortunate misrepresentation. As responsible horse owners, we need to consider physical pain and discomfort first, then rule it out or address it in order to then successfully address the behavior issue or habit that may be associated with this discomfort. Run your fingers (carefully) from the center of the rib cage (under the horse, sternum) up towards the saddle area, across the ascending pectorals (see image). Look for reactions: Anything from muscle flinching in that area to more volatile reactions like kicking and biting. NOTE: Be careful! Start with very soft touch, take it up a notch only if no reaction from the horse. Never press harder than would be comfortable for you. Practice on your own leg first. Did you get a reaction? If yes, it is time to investigate girth fit, tightness, material, placement, etc. Your horse is in discomfort!! 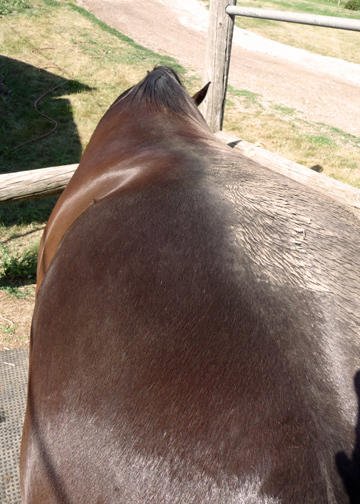 More clues: Is your horse ‘short-strided’ or tight in the shoulder? This could be another indicator of discomfort in the deep pectorals. The detective work in finding out what causes the discomfort in the girth area (meaning in the deep pectorals) does not stop at riding equipment. You also need to look at feet, any hidden front leg or shoulder discomfort, tightness in the poll, imbalance in self carriage. The underlying problem can also be a subluxation of any of the underlying skeletal structures (vertebrae), often called a ‘rib out’. 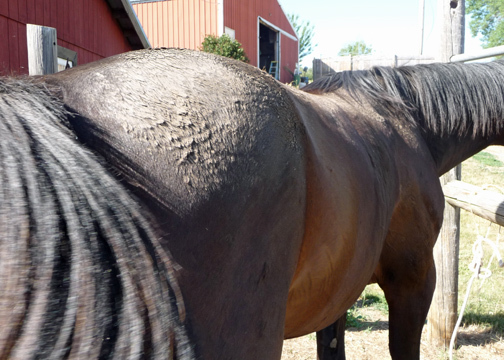 Contact an equine chiropractor to rule out this very common cause of girthyness. More often than not, it is difficult to find the reason if all factors have been sufficiently addressed and girthy behavior persists. 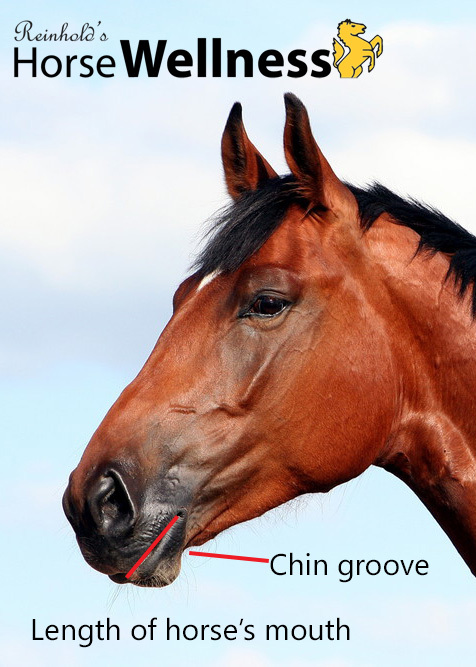 Gentle bodywork that addresses the entire system of the horse’s body and rules out compensation patterns – such as the Masterson Method of Integrated Equine Performance Bodywork – will often be the key to resolving the hidden causes of girthy behavior. Looks nice, but doesn’t fit. This saddle bridges and slides back under the rider. A torture instrument for the horse. Back pain: the horse anticipates back pain when being ridden and thus has anxiety around the saddling process (for example: back-pain due to muscle spasms or hock problems). Sore feet: The abdodimus pectoris muscle can get tender and sore when horses have pain or soreness in their front feet because of the way the horse moves to avoid the pain. An expression of fear has no place in the saddling process. Equine massage or body work can help with any muscular issues, whether they may be primary – such as muscle spasm – or secondary – such as sore ascending pectoral muscles due to sore feet. cause for the discomfort is remedied, the secondary discomfort and tension due to compensation can often be helped within only a few sessions of equine massage or body work. Only then is it time to replace the problematic and now habitual behavior in the horse through training measures. For a more thorough day-to-day technique, read “How to groom your horse to shine in 4 easy steps“.